In popular culture, Southern California's Santa Ana winds have been portrayed as harbingers of chaos, strange behavior and most notably, fire. And they're changing, with potential big implications for the SoCal fire season. These intense, dry gusts, sometimes referred to as "devil winds," can lead to coastal heat waves, downed trees and the spread of the region's most destructive wildfires. Santa Ana wind conditions played a role in the massive Thomas Fire that broke out in December 2017, scorching more than 280,000 acres across Ventura and Santa Barbara counties. The Santa Anas also contribute to Southern California's characteristic sunshine and year-round warmth. But a new study out this week suggests that rising temperatures as a result of climate change could have a big impact on the timing of Santa Ana wind season, compressing more of it into December. The results of the study, published this week in Geophysical Research Letters, project that Santa Ana wind frequency could drop nearly 20 percent by the end of this century. “We found that, in general, Santa Ana winds are likely to diminish with warming," says Alexander Gershunov, a researcher at Scripps Institution of Oceanography in San Diego and the study's co-author. The study's forecast was drawn from eight global climate models adjusted to detect more localized weather characteristics. The predicted decrease in Santa Ana wind activity is expected to be most pronounced in the "shoulder" seasons, with big declines in October and May. "Really it's that Santa Ana winds are expected to diminish in the fall and spring," Gershunov says. Peak wind activity will likely occur in December, which is typical historically. In the paper, Gershunov and co-author Janin Guzman‐Morales suggest that changes in the timing of Santa Ana winds could alter Southern California's wildfire outlook. But just how this will affect fire season is "much more nuanced," according to Gershunov. 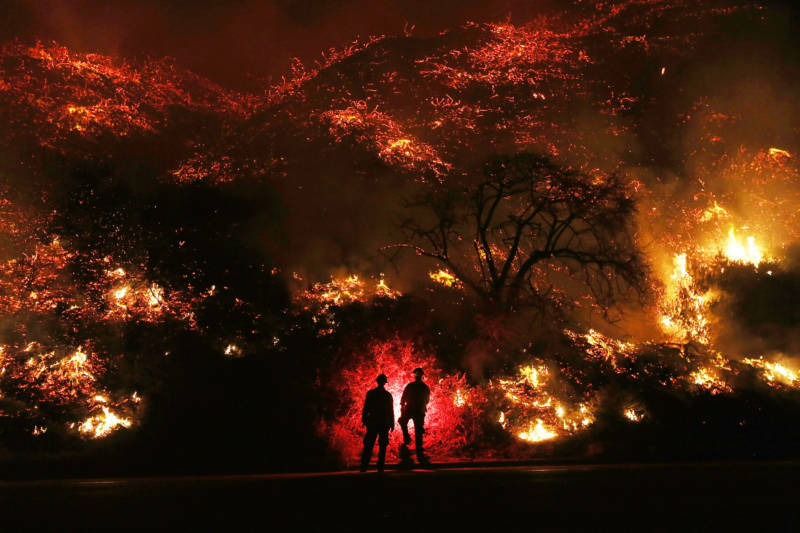 "Santa Ana winds do drive the most catastrophic wildfires in Southern California," Gershunov says. "But they’re not the only ingredient." In other words, don't expect the shorter windy season to mean less wildfire risk. "Dry fuel" from vegetation is another key factor in the spread of wildfires. According to Gershunov, trends for rising temperatures and changing precipitation patterns mean that the prevalence of fire's natural fuel could persist into winter, when the winds are at their most frequent. “I think that these changes together mean a later wildfire season in Southern California's future," Gershunov says. The worst of California's fire season typically peaks in the fall months. But the Thomas Fire was exacerbated by a warm, dry fall combined with a series of Santa Ana wind events starting in December 2017. Gershunov says the likelihood of similar fire conditions could increase. "We can’t say anything with any confidence at this point, whether the fire season will intensify or decrease on average in the future," he says. "But this later fire season does suggest that future fires may burn longer, because as the wildfire season shifts to December, which is the peak of Santa Ana wind activity, we’re more likely to get back-to-back Santa Ana winds. Mimi Hughes largely agrees. She researches climate at the Cooperative Institute for Research in Environmental Sciences at the University of Colorado, Boulder. Hughes has modeled how climate affects the Santa Ana winds. The winds are powered by the sharp pressure difference or "gradient" between the Great Basin — a vast interior region spanning parts of Nevada, Utah and Oregon — and the Pacific Ocean off the Southern California coast. But while the Santa Ana winds feel hot, that pressure gradient depends on the presence of high-density cold air masses over the Great Basin. "These [winds] actually happen when it's cold in the desert interior, which is kind of counterintuitive," Hughes says. "If you have less cold air in the desert, then that actually means that you get fewer of these pressure gradients that can set up the conditions that are ripe for Santa Ana winds," Hughes says. According to Hughes, the Scripps study implies "an increased likelihood of fire later in the season." And like Gershunov, she says that to understand the bigger picture of what this spells for Southern California wildfires, other factors must be taken into account. In particular, she says the dry and wet extremes in the region are projected to increase. "So if you had a very, very dry winter, and then compound that with the fact that the Santa Ana season is a bit later," Hughes explains, "Then you could really see this being potential for devastatingly large fires."